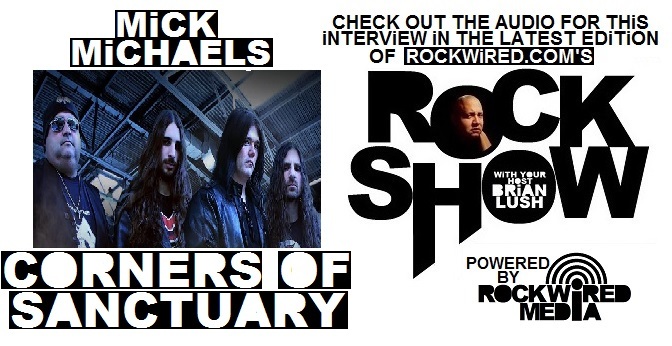 "ROCKWiRED NOTES: CORNERS OF SANCTUARY | MiCK MiCHAELS OF CORNERS OF SANCTUARY TALKS TO ROCKWIRED ABOUT THE BAND'S NEW ALBUM THE GALLOPiNG HORDES"
here is something to be said for the drive of a band like CORNERS OF SANCTUARY and their mission to bring traditional metal back to the forefront. Nothing has stood in their way. Not even a significant line up change. 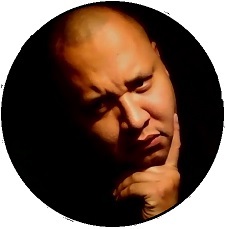 In 2016, the band had wrapped up the recording of their album THE GALLOPING HORDES but at the finish line, lead singer FRANKIE CROSS chose to walk away from the band. Due to the shake up, the band put the release of the album on hold and began the search for a new lead singer. They ended up with a female lead singer named TREESE LOGAN and the band had decreed that LOGAN would dub her own pyrotechnic voice over what had been laid down by FRANKIE. Things were looking up. CORNERS OF SANCTUARY was headed in a new direction with a female lead singer and all was going to be right with the world. At the beginning of this year. LOGAN stepped down as lead singer and when the band knocked on FRANKIE CROSS's door to ask if he would fill in for some scheduled dates, the only question CROSS had was "when?". Ever since, CROSS has remained with the band. The band's latest album THE GALLOPING HORDES was finally released and one can hear a band that has been rejuvenated in the tracks of this latest album. Oh and to top it off, the band just got done with a tour of Europe. 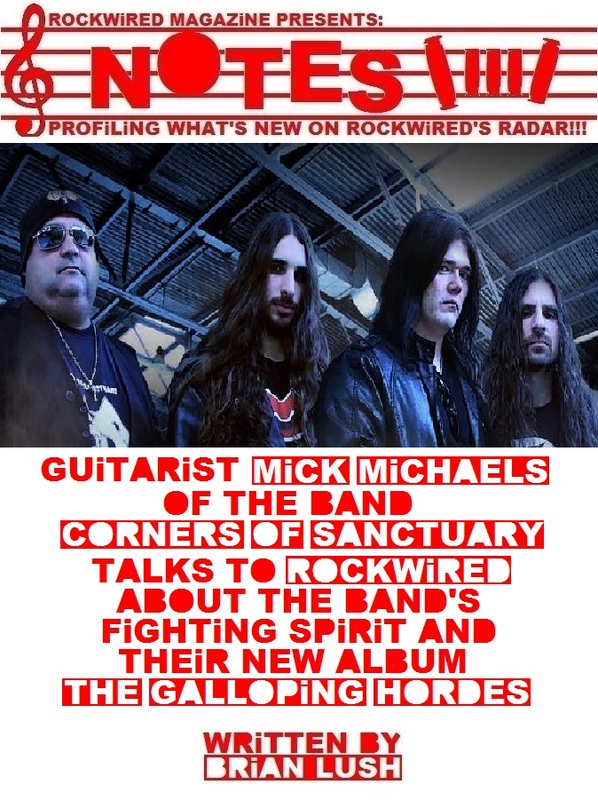 ROCKWIRED had a chance to speak with CORNERS OF SANCTUARY guitarist MICK MICHAELS regarding the band's recent European tour and their new album. Here is how the interview went. In all of the years that I have been doing this, I have never seen a band lose a lead singer, delay an album, get a new lead singer and then have that lead singer quit only for the old singer to come back and then tour Europe and release an album. You just can't write this stuff. It is. It's been a crazy year, but we're very fortunate that things worked out the way that they did and that we're able to move forward. It's kind of exciting. Well, we've been hearing about this album THE GALLOPING HORDES for a while and now it's finally here! How does it feel to have it out now? It's refreshing for sure. We've been keeping this thing under wraps for quite a while now. 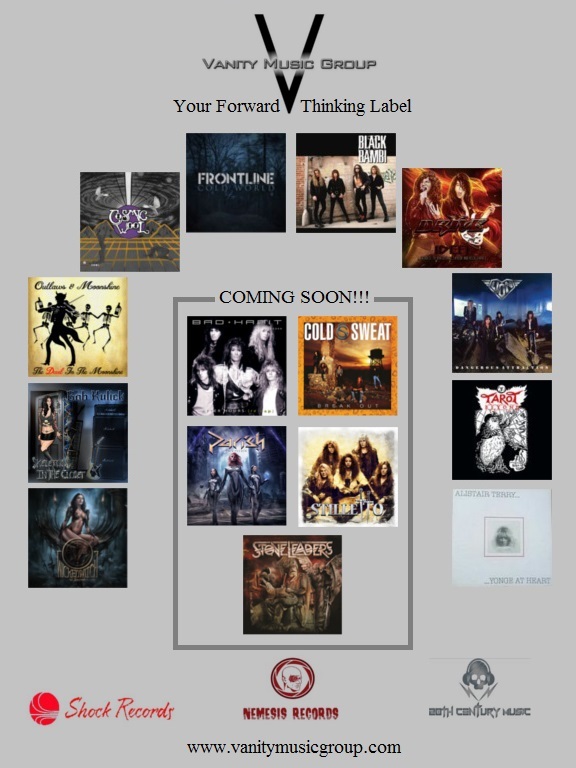 We had actually started recording it in early December of 2016 so we had originally planned on having the album out by the middle of 2017 but we had the shake up with the line up and we weren't sure which way we were going to go. So it's refreshing to have the thing out there, but it's exciting at the same time. We had been dying to get this material out and share it with everybody. We've changed the flow of it a little bit. 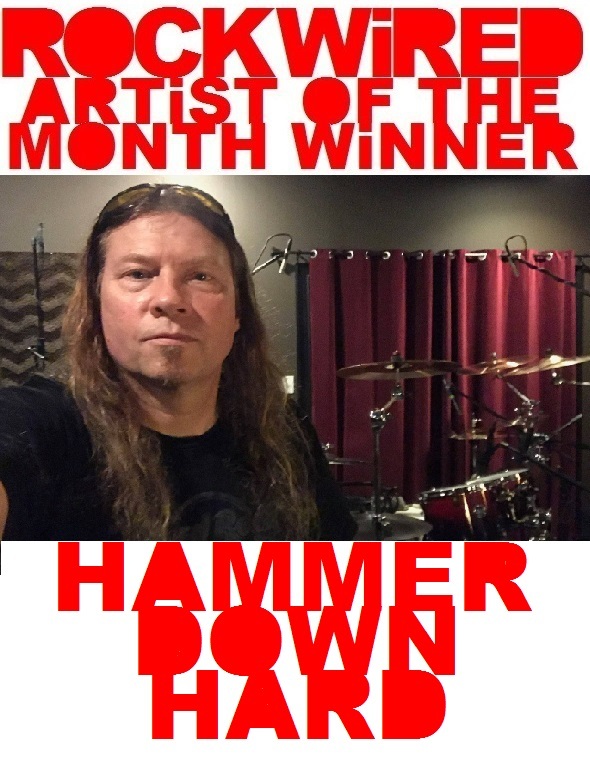 It's still a traditional metal album, but we went a little heavier and at times, we go in more of a progressive direction as opposed to the direction of some of the previous albums. We've made this one more musical. There is more air for the singer to do the job that they are supposed to do. A lot of the melodies on this album are created through the vocals whereas on previous albums, the melodies were created with guitar. This time, we took a different route and we got to work with BILL MATOYER out in LA in mastering the final album that you hear. You guys have just finished a tour of Europe. How did that go? We did ten days. It was our first time out there and it was phenomenal! It was my first time in Europe and it was really great! The countryside was wonderful and the people were very welcoming and the music was well received. We did a small festival while we were there and then we did a venue tour. We were in Belgium, Germany and The Netherlands. We were about an hour outside of France. It was great. It really was. Our style of metal seems to be more popular over there than it is here, which is pretty cool. We didn't really run into a whole lot of the death metal crowd there. I know it exists there, but maybe because of the circuit that we were on at the time, we didn't really come across any of it. The people were great and the other bands were great! It's amazing that someone other than yourself wants to hear your music. After doing this all of these years, that still baffles me. Here we were across the sea and none of us could speak a lick of the languages there, but the music that we played brought everyone together. The phenomenal thing is that people came out to see us specifically and that just blew our minds. It was definitely an experience for us and we really hope that we're able to go back next year. What other differences did you notice about the reaction from a European audience as opposed to an American? I'll tell you this, they stayed the whole night until closing and in some cases, beyond that. Our experience here in the States is that around ten o'clock, the venues start to thin out. People want to go home for whatever reason. It's a typical thing for bands that go on at the eleven, twelve or one o'clock time frame. You notice that the later it gets, there is no one there. We noticed that in Europe, the later it gets, the more people come out. People are coming out at eleven o'clock and they stay the whole time. The other thing we noticed is that for the venue shows, is that they don't stack these shows three bands deep. So you have two opening bands and then a headliner. Here in the U.S., you've five or six bands playing before you actually get to the headliner. It's easy to get lost in the shuffle. Sometimes you are on and off so fast that you spend more time packing up and driving than you do onstage. In Europe, it was really cool. Metal is still thriving there and it's not competing with everything else. I also found out that through talking with people as best I could, that just because you're a metalhead that doesn't mean that that is all you listen to. They were into everything. Southern rock is very big in Germany and so is pop music. They have their own brand of pop and then there is American pop. Country music is also big. There is a lot of that going on. I think that is why there were a lot of people coming out to these shows, because I think that music is something that is really appreciated there. That's kind of what we were able to pick up on. What was the reason for FRANKIE CROSS' wanting to leave the band in the first place? After having looked back on all of it and having had some discussions about it, I think at the time, we were doing so much. We were doing tons of back to back shows and we were recording and had so many things happening that I think he felt that he was running out of air and that he didn't know what to do. So, he did what he thought was the simplest thing to do and he decided to go. We did our part to maintain things as best we could but you know how things go. So we mutually parted ways. In that time frame, he got some perspective and was able to get some of the juice back and maybe he had realized that we could have done this in a different way. We had started talking to him again last October when he came out to a few of our shows and a truce was made. Around Christmas we were talking again. When we did the West Coast tour last year we were like "Man! FRANKIE should be here!" 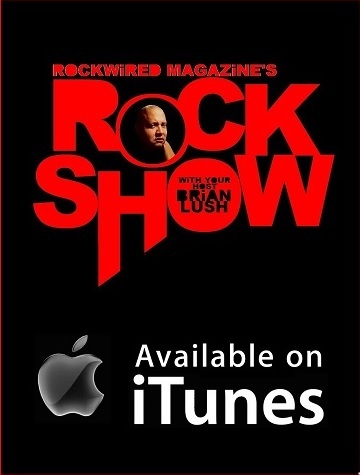 As a band, we kind of left the door open and when the shake up happened in January with TREESE LOGAN, we had already been obligated for some shows. JAMES PERA decided that he was going to reach out to FRANK and see if he would be willing to do these shows and FRANKIE said "Yeah!" So we he had the door open and FRANKIE already had his bags packed and was at the door. It was like we were all working toward the same thing without even thinking it. We feel really fortunate that the band was able to get back together and there is a new energy to us because of it. And what was the reason for his replacement TREESE LOGAN calling it quits? Well, there was a list of them. I don't want to talk out of school, but the bottom line is it was inevitably coming anyway. Not necessarily from her, but from us. You've got to put the time in. You've got to work hard and you can't make excuses and there are a lot of sacrifices involved in this kind of thing. I know that may sound like a crappy way of putting it, but you've got to do all that you can and some people weren't prepared for all of that. I don't think that they really had any idea what they had signed on for even though it was told to them and explained to them in detail. And because of having to ask certain people to do something again or put in a little extra time, it was starting to create tension between everybody and it was very difficult to working those conditions at times but our goal was to keep the music alive and out there. We were doing all that we could and made additional sacrifices to appease her and the situation, but when you're in a one-sided relationship, it starts to wear thin and everything starts to go downhill. When she quit, she kind of beat us to the punch, but that's okay. What kind of reactions have you been able to gauge from the release of THE GALLOPING HORDES? A lot of the songs for this album were debuted on stage in Europe. The album was released on August 10th while we were in Belgium. We used this tour as a way to debut some of these songs live. We weren't sure how people were going to react. There were a couple of songs that we threw into the set and not being sure if there were "live" songs or not. However, everything we did was well-received and it's been pretty much that so far. The handful of reviews that we've gotten back for this album have been really positive. People are definitely liking it. It still has that old school vibe and there is this section of the heavy metal population that we seem to strike a chord with and that's okay. I think this album is going to push us further. The nest album is going to build off of that. 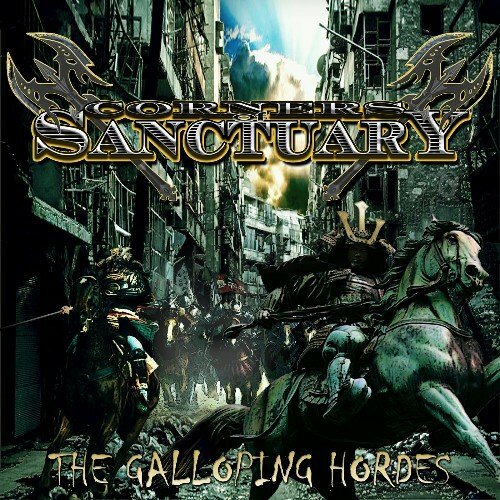 What songs off of THE GALLOPING HORDES have you the most excited to get people to hear and why? HAIL HAIL is definitely one of my favorites. I co-wrote the song with our drummer MAD T. We have a video coming out for it next month which we filmed while we were in Germany. We had one day off and we had a couple of hours when we were able to shoot the video in Hanover. I'm excited about the song and I'm excited about the video. The song really has this old school JUDAS PRIEST, DEFENDERS OF THE FAITH-type of feel. It just hits you in the face from start to finish, so I'm excited for people to be able to hear that if they haven't heard it in our set. It's new to the set about midway in and it'll be cool to share it with people. Any other tour dates on the horizon? We have some East Coast shows that we're doing right now. We'll be up in Northern Pennsylvania tomorrow doing THREAT FEST and then the following week, we'll be in New Jersey supporting a band from the eighties called ROUGHHOUSE. They were a glam band. They were signed to COLUMBIA or something like that. And then we have a show in Baltimore and then we're heading out to do a West Coast tour in the beginning of November, so we get to bring FRANKIE out to the West Coast for the first time since he missed it last year. We're going to be doing six or seven shows in a week. We'll be play the RAINBOW ROOM and a bunch of other places on the Sunset Strip. It's pretty exciting! Despite everything that you guys have been through this year, it's like you didn't miss a beat. I'll tell you what. If it looks like that from the outside, then we are really doing our job. It has been hell here! I'm not a drinker, but this year could've pushed me over the edge to start drinking. Sounds like material for another album. With THE GALLOPING HORDES, what is the big takeaway? What would you like for people to come away with after they hear the album? I want people to feel that the band is maturing musically. This might be a dirty word for some people, but I feel that the sound is more polished. By "polished" I don't necessarily mean a glossy production value. There is a better production value on this album then there was on our previous album. When I say "polished" I'm referring to the quality in songwriting. 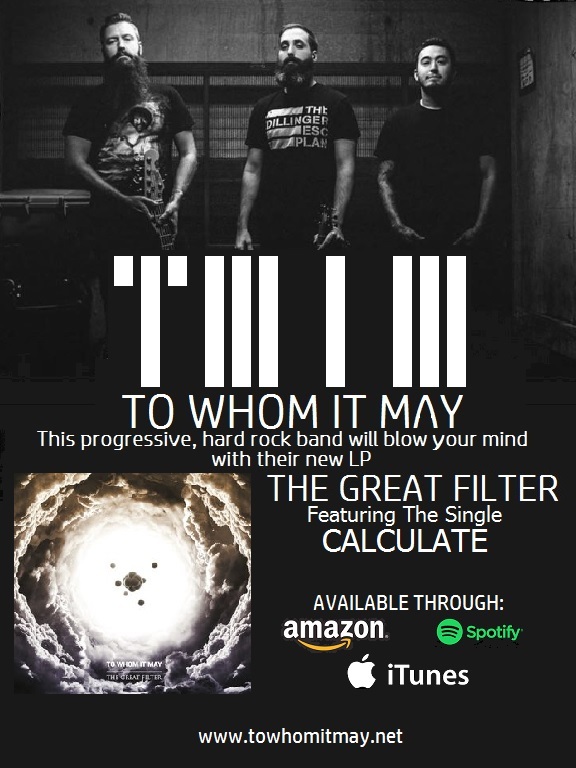 I'm very proud of this album because of that and one of the things that made this album stand out songwriting-wise is that most of the band was involved in it this time. There was a real push to get everybody involved in writing. For years, I've been the primary writer and I'm cool with that, but sometimes I want some additional input and perspective. I wouldn't mind someone else picking up the load sometime. MAD T our drummer also plays guitar, so there are riffs that he wrote that we have incorporated. I had to learn somebody else's style which was cool. It helped with my playing and that changed the songwriting. When you work with someone else on songwriting, it changes things. JAMES wrote some songs and even FRANKIE made some lyrical contributions. I think fans of our music are definitely going to notice the change in our music and because of that, I think we're going to get some attention from other people that haven't had a chance to hear us.